Join us at Pauatahanui Inlet on Sunday for the WWA fun day. Bring your friends, kids and the rest of the family along, meet new (and old) members for freeride, free-style and free-bbq! Directions to Motukaraka Point at Pauatahanui Inlet can be found on our local spots pages here (http://wwa.org.nz). Look for the WWA flag. Non-members and new members welcome! The Inlet is pretty hard on the feet, so be sure you and your kids have footwear suitable for in the water. We'll be arriving just after hide tide, from around 10.00am so hope to see you there! 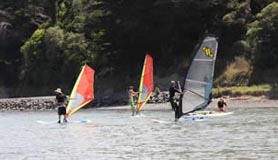 http://www.windsurfingnz.org/content/wwa-fun-day-pauatahanui-all-welcome.